Come to think of it, the fun of lights, music and action called Vivid Sydney is not too far away now, as at the time of writing this. Lights will come on at 6pm every day from the 23 May 2014 - 9 June 2014. This deluge of free entertainment will keep Sydney siders away from hibernating in their own homes, and out enjoying themselves. No doubt, this event also contributes to Sydney's economy in a positive light. 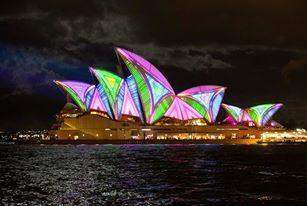 On this, do you enjoy Vivid Sydney? Why or why not? Definitely a fan. It makes the whole city seem like it's in celebration, which in turn makes it almost impossible not to feel cheerful. Love it! Love it. Kids get so excited when it's Vivid time once again! Unfortunately when I went to Vivid last year I did not have such a fun experience. I don't know if this is because I chose a particularly bad time, but as it was, I was hemmed in by hordes of people for almost the whole time. I could not get any decent shots of the lights because there were so many people about and the experience left me feeling somewhat claustrophobic, bored and disappointed. However, I have seen some vouchers on groupon regarding some cruises that are taking place in Sydney for around $35 each on the Vivid nights for this year. Perhaps this is a better way to avoid the crowds and still get to experience the beauty of the city when lit up by the lights. I also feel that proper research prior to the event and visiting on a weeknight rather than on a Friday night or weekends would have enabled me to experience Vivid more positively. I am hoping to return this year armed with better information and prior planning. Best place to buy candles in Sydney? Best food court in Sydney? Best free activity in Sydney?